In the world of direct marketing and preference management there is a lot of buzz about the elements of the Telephone Consumer Protection Act (TCPA) amendments that pertain to wireless expressed consent. In an unofficial poll of my non-industry friends, nobody is talking about it. However, with just two months left to prepare, companies need to put these new rules on the forefront, adapting their preference centers and other customer touchpoints with compliant disclosures that will not confuse or put-off consumers, and that will be successful in obtaining opt-ins. Today’s standard is what our organization refers to as ‘implied consent.’ In other words, if a customer provides a company with his or her wireless number in the context of doing business, the company could use that number for solicitation using a dialer (do not call considerations permitting). I feel I should point out that “solicitation” is a broad term and includes retention campaigns, upsell/cross sell campaigns, winbacks, and even follow-ups to direct inquiries. The regulations also cover SMS and pre-recorded messages, including couponing and sales alerts. Starting October 16th, companies will need to have the customer’s express written consent to contact them via a wireless number for marketing purposes at all, regardless of DNC considerations. There are specific disclosures to which a consumer must provide an affirmative opt-in preference to meet the new consent standard. While this aspect of the amendments is limited to live calls and SMS to mobile phones and prerecorded messages, further regulation seems to be a matter of when, not if. More opt-in regulation means even more complex challenges for direct marketers. Many of these challenges are met with an effective preference management strategy. I advocate that it is vital for companies to start capturing and acting on customer communication preferences (opt-in and out) across all channels now. In doing so, your organization can create loyal and happy customers, enable personalization and customer engagement, and stay ahead of the regulatory curve. There are serious implications for companies that do not comply with the new TCPA amendments, from steep fines to potential class action lawsuits. 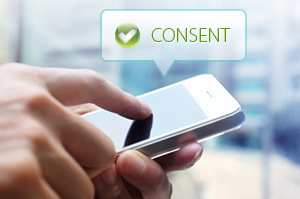 Companies need to have a plan in place now to collect opt-in consent from new and existing customers and prospects, to maintain records of consent, and to leverage the consent correctly. Obtaining wireless consent seems like a foreboding task for large organizations, but it is a necessary step to ensure compliance in any organization’s overall preference, consent, and personalization strategy. Coming next week: Ken Sponsler from CompliancePoint will discuss some of the specific requirements for obtaining wireless consent.